On this day in dinosaurs, researchers announced that dinosaurs achieved sexual maturity before they were done growing. Studying the skeletons of the herbivorous Tenontosaurus and the famous predatory Allosaurus, paleontologists discovered medullary bone–a kind of bone produced by expecting mothers. The expectant Allosaurus mother was only 10 years old when she died, while the Tenontosaurus was 8 years of age. In an earlier study published in 2005, researchers identified an 18-year-old Tyrannosaurus rex with medullary bone. It appears all three of these dinosaurs would have been able to rear young prior to their untimely deaths. With tumultuous adult lives, this strategy of breeding as adolescents ensured dinosaur species would continue to proliferate despite many hardships. The dinosaurs were just beginning their ascent 231 million years ago when Eodromaeus strode across what is now Argentina. The “dawn runner” was one of the earliest dinosaurs and was a prototype for the body plan that would come to dominate terrestrial ecosystems throughout the Mesozoic. 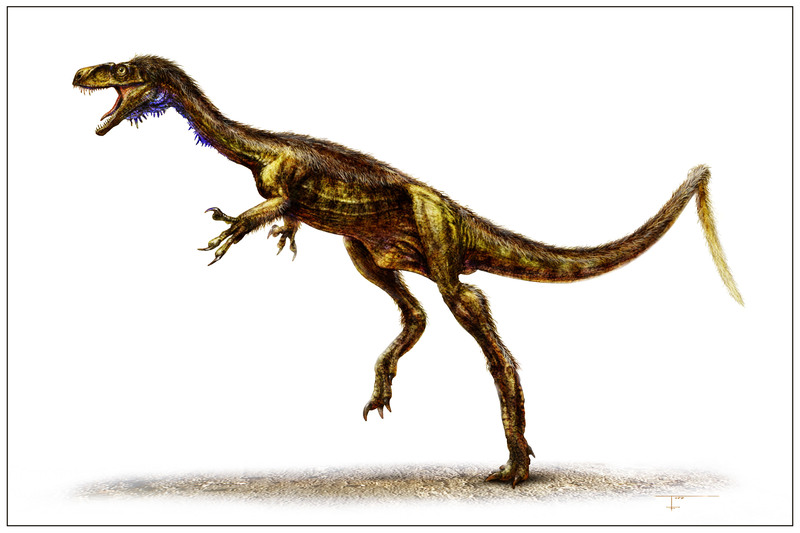 Paleontologist Paul Sereno likened the animal as close to the “Eve” ancestor of all subsequent dinosaurs. Whether or not it’s Eve, Eodromaeus was undoubtedly one of the pioneering dinosaurs way back in the Triassic period. Eodromaeus was around 4 feet long and weighed around 11 pounds. This little racer might have been able to run as fast as 20 miles per hour. We hoped you enjoyed today’s double feature! Share your pictures of both early and late dinosaurs, agile hunters, and expectant mothers with us on Facebook and Twitter using the hashtag #TDIDinos.